This subject guide serves as a point of departure in finding information on MOOCs as well as providing further avenues for self-exploration. It is a work in progress as the contents will change as new resources are added or removed. You are encouraged to make suggestions for content to be added or removed. Some linked material on this LibGuide may be subject to copyright and licensing restrictions. Please check and ensure that you obtain the necessary copyright permission, or apply the correct creative commons license where applicable. Due to contractual and licensing agreements, access to some content may be restricted to the Unisa community. The Oxford dictionary definition of a MOOC is: "a course of study made available over the Intenet without charge to a very large number of people." EDUCAUSE's definition of a MOOC is: A massive open online course (MOOC) is a model for delivering learning content online to any person who wants to take a course, with no limit on attendance. How//where did "MOOC" originate? WhatIs.com provides a brief history of the MOOC. The term "MOOC", normally pronounced moo-k, stands for Massive Open Online Courses and was coined by Dave Cormier (University of Prince Edward Island) in 2008. At the time, Cormier was attending the very first MOOC, a joint effort of Athabasca University and the National Research Council (Canada) called "Connectivism and Connective Knowledge". EDUCAUSE and the NMC discuss the MOOC and its place in current higher education trends in detail here. See pages 11-14 of the 2013 HE Edition report, and the Horizon Project's Wiki for discussion from the contributors. 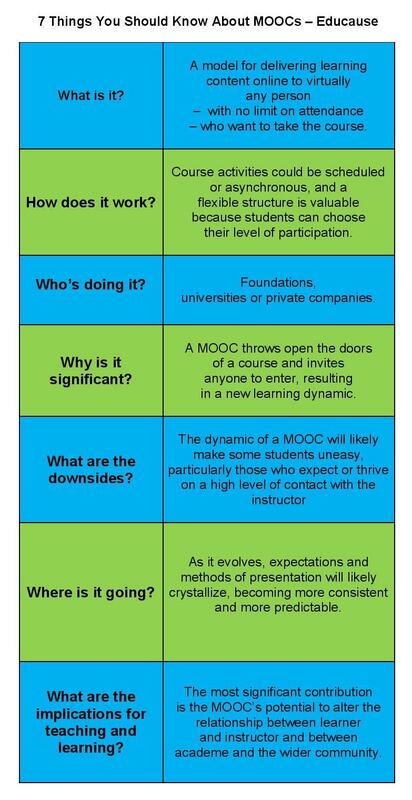 Ken Masters (Sultan Qaboos University) writes a very accessible analysis of how MOOCs have developed, and what separates them from other models of online education. Inside Higher Ed have compiled a number of their useful articles and editorials about MOOC administration, pedagogy, and news into a single, easy-to-read document. Forrest Wright (Thomson Reuters) briefly explains the issues libraries and librarians face in serving the instructors and students involved in MOOCs. This is The Chronicle of Higher Education's launchpad for MOOC-related materials; notice the timeline of news and features, which the Chronicle continues to expand.